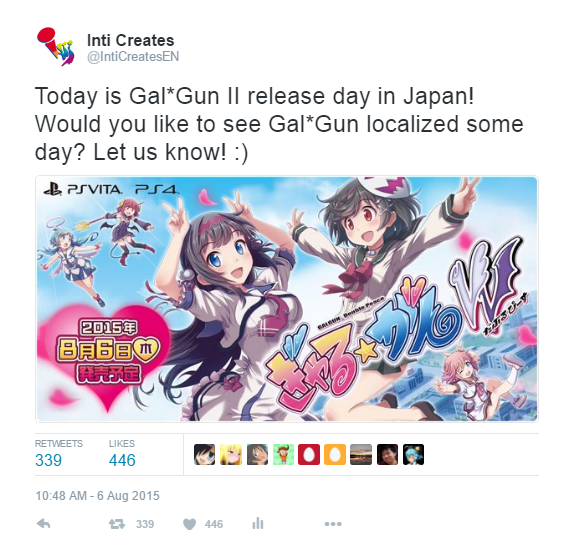 When I joined Inti Creates back in September 2014, Gal*Gun Double Peace was still in development, with a summer 2015 release planned for Japan. Its predecessor, the original Gal*Gun which released on Xbox 360 and Playstation 3 in 2011-2012, never got a western release. So before I got my grubby hands in there, Double Peace was planned to have the same fate of a Japan-only release. I was a huge fan of the original game, and I knew damn well that I was far from the only western gamer who enjoyed games like Gal*Gun. Turning a game that all of your superiors thought had no chance to sell overseas into one that was worth putting in all the effort required to make an international release was a tough sell, to say the least. I remember I first brought up the idea of localizing Gal*Gun Double Peace in earnest when I took my first overseas business trip with my boss. We were sitting around the airport just waiting for our plane, so I figured, now was as good a time as any to make my pitch. My boss is a super good guy, so while he was sympathetic to my desire to release the game outside of Japan, the team just didn’t have the confidence that it would sell, or even be received well at all by western gamers. Over the next couple of months I would toss friendly reminders to the team that this was something I truly believed in, and all of that came together on August 6, 2015, which was of all days, the Japanese release date for the game. I figured that the people who cared about this game would be following the Japanese release date, so I decided it would be a good time to test the waters to see if my firm belief that my fellow westerners really DID love games like Gal*Gun held any water. My dear, sweet Internet. Suffice to say, you did not disappoint. This little tweet that I just sent out on a whim spread like wildfire around the Internet. By the time I came into work the next day, this tweet had become our new champion in terms of views, impressions, and just about every other measurable category. Forums, message boards, and all kinds of websites both small and large were talking about it. With newfound data and concrete proof that what I’ve been saying this whole time wasn’t a bunch of malarkey, I presented this to my superiors and senpais. Discussions were had, and just a few days later, we decided that we were gonna do this! 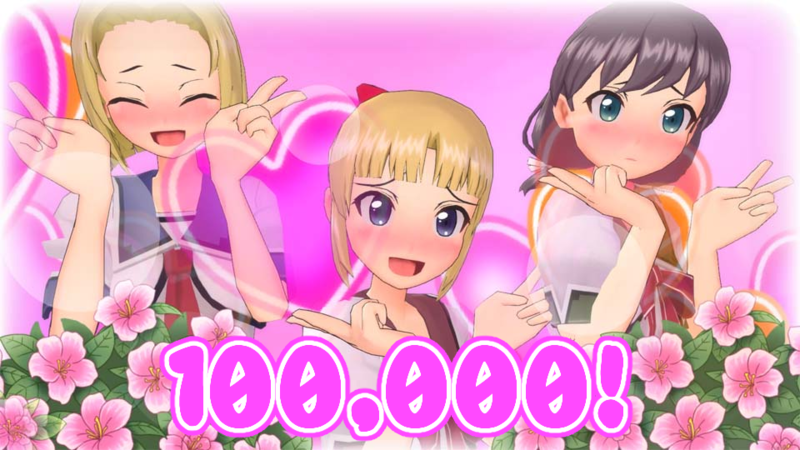 Gal*Gun: Double Peace was now officially coming to the west! Woo hoo! We were gonna do this thing the right way, with both a physical release and a digital release for PS4 and Vita, just like we did in Japan. However, as a smallish Japanese company with no offices outside of Japan, this would be pretty much impossible to do on our own. We needed an ally; a western publisher who believed in the marketability of Gal*Gun as much as we did. That’s when we met PQube. You, the Gal*Gunners around the world, have spoken. You helped me prove to everyone here at Inti once and for all that people around the world DO love Gal*Gun. 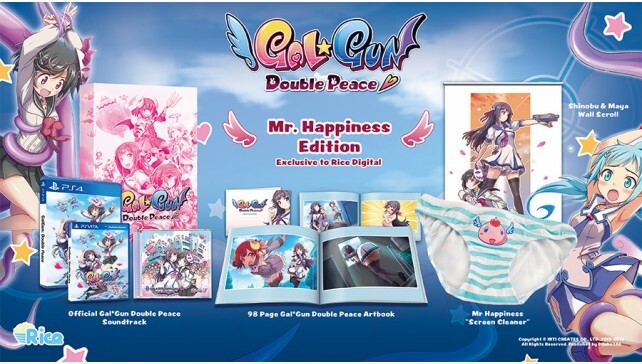 It’s been an honor to work on Double Peace for you guys, and I’m looking forward to help bring Gal*Gun to the world of VR with our upcoming “Gal*Gun VR” (working title) project!